This morning I attended the annual 10 Trends that will Share the World in 2013 and Beyond, presented by Ann Mack, Trend-Spotting expert from JWT. 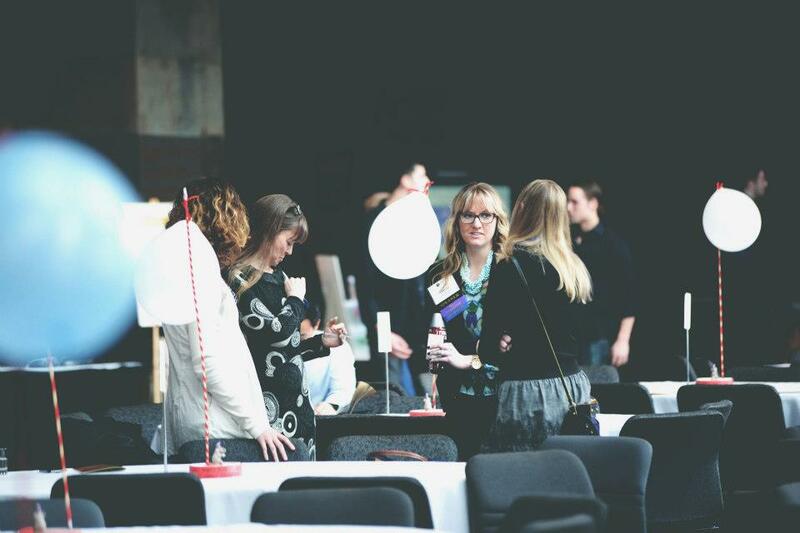 It was sponsored by The Advertising Federation of Minnesota and at their monthly breakfast event. 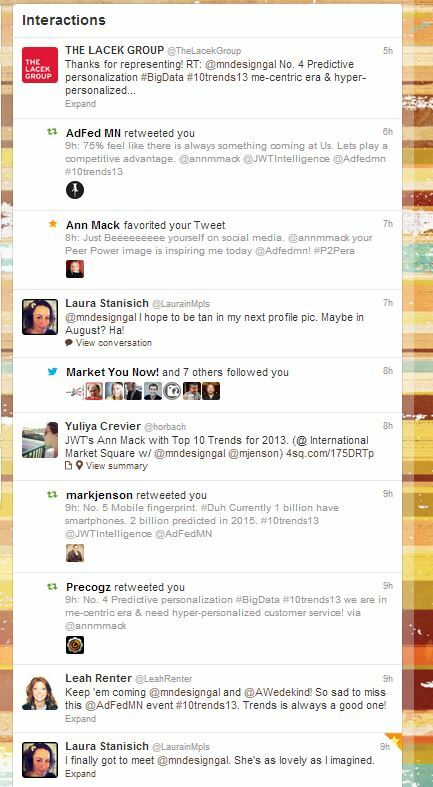 I kept my notes raw for you below, so you can see how I interpreted the 30 mins presentation by Ann. It was nice I actually walked in with her and got some one-on-one since it was the 3rd time we had met. She works and lives in NYC and laughed at how early the 7:30AM breakfast was and how lovely the weather was in Minnesota of course. (smart sarcasm) I admire her presentation skills, style and down to earth personality. 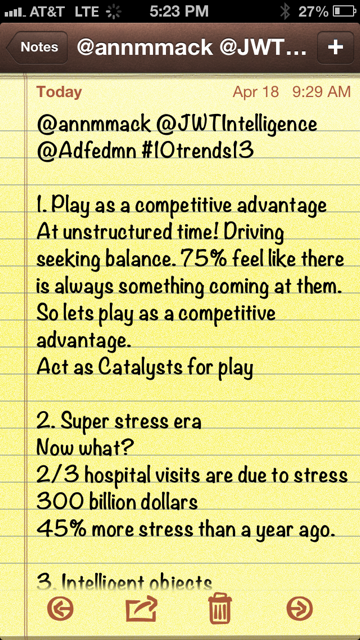 Read through or skip to my hashtag follow and get a snapshot #10Trends13. So lets play as a competitive advantage. Smart Fabrics, geek to chic! Each min of each day, 2 million searches on google. Harder than ever before to reach us. I see it. I want it. Let me learn about it, BEFORE I buy it. Window shopping and purchases after hours. We are trust strangers (don’t tell the kids). 59% teens I try to keep parts of my life private, but my friends share everything. I wonder where that photo will go? You may have remembered last year’s post, or you can compare the trends by reading more. Stay smart and remember you won’t learn without the effort to attend events, listen to smart people and shake (and many cases I hug) friends and peers. Pictured here a recent non-profit event held locally at the U of M that I spoke at. 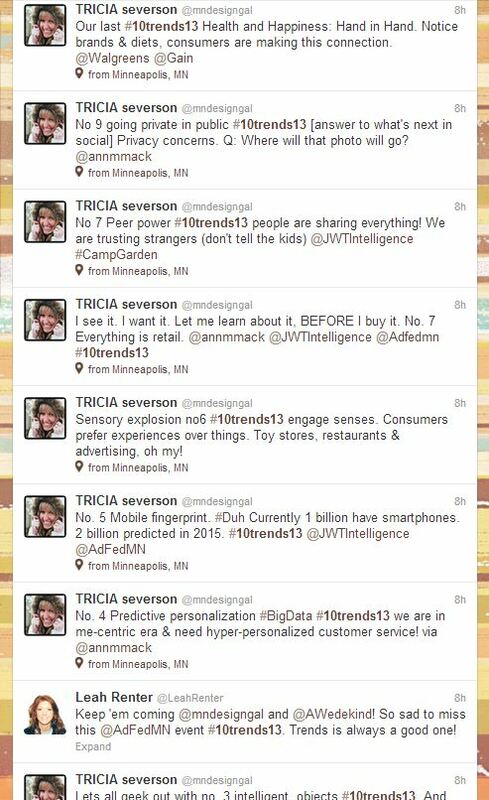 This entry was posted in the advertising life, think-tank and tagged Ad Fed MN, Ann Mack, Digital Trends, JWT, trends, Trends 2013 by mndesigngal. Bookmark the permalink.